Claire grew up in North Wales. She wanted to be a vet from the time she could talk and has always been happiest in nature. During her veterinary training at Edinburgh University, she developed a keen interest in exotic medicine at their specialist hospital. She, therefore, focused her work experience on zoo and wildlife work, working in UK zoos and with a wildlife vet in South Africa. Her desire to travel and experience diverse environments also took her to Panama, where she worked at a spay and neuter clinic. After graduation, Claire got a feel for remote charity medicine by treating horses and donkeys in Morocco. 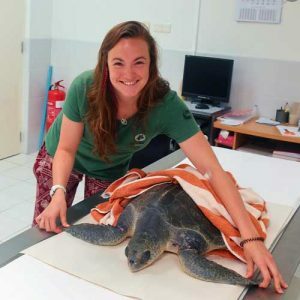 Back in the UK, she joined a practice in Kent that specialises in exotic species and wildlife. Claire has always had a passion for conservation, selling artwork during university to raise money for conservation projects. Being a keen surfer which has intensified her obsession and love of the ocean. Through surfing, she became alarmed at how polluted much of our oceans are. Claire has always dreamed of working in conservation, particularly in the preservation of our oceans and its marine life.